Author Greg F. Gifune pens an eerie, disturbing atmospheric tale of violence and redemption in Gardens of Night from Uninvited Books. Gifune's track record runs the gamut from shorter works to several novels and he also works as the associate editor at Delirium Books. Marcus is a broken, damaged man, treading the path to recovery with his broken, damaged wife, Brooke; the nature of their damage is unclear, only that they desire to move past it and patch their shattered relationship in the aftermath. Together with their childhood friend Spaulding, they take a vacation to a remote cabin near the Catskills, in the hopes of regaining a semblance of peace and normalcy. What should be an easy and natural retreat to the country side is complicated by dreams which refuse to relegate themselves to sleep alone. Marc's nightmares bleed over into reality and the everyday world, in which an innocuous walk through the woods becomes a sinister maze of strange portents and visions. Figures benign and malignant are lurking around every corner, and Marc's world quickly spirals out of control, assaulted by visions of his past, his present, and events about to unfold. Gifune's introduction intrigues, and his skill as a story-teller is evident in what he chooses to withhold from an audience rather than what he reveals. What happened to Marc and Brooke that left them so broken is deftly woven into the narrative as it reaches a twisting conclusion. Philosophy, mythology, and debates on the nature of God abound as Marc struggles to make sense of the inherent violence within nature and within himself. Gardens of Night is a story about transformation and violence as much as it is about destiny and sacrifice, and it would do a reader well to brush up on their mythology if they would like to enjoy the larger themes employed in this introspective work. 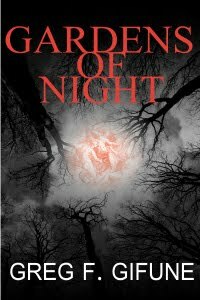 Gardens of Night makes for a quick, enjoyable ride for the reader who enjoys a mystery that cannot easily be defined and figured out, keeping one guessing up until the conclusion just how Marc will resolve his past with the colliding future. This is a well-executed work which showcases Gifune's gift for creating an atmosphere of unease with an economy of words. Martin Rose lives in New Jersey, where he writes a range of fiction from the fantastic to the macabre, holds a degree in graphic design, and enjoys blurring the line between art and life. 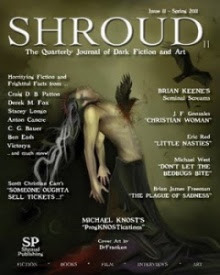 Look for his work in the anthologies Fear of the Dark from Horror Bound publications and Art From Art from Modernist Press. More details are available at www.MartinRoseHorror.com.